Ascent: 984 feet in 0.36 miles along the East View parking lot using the Sunrise Trail. 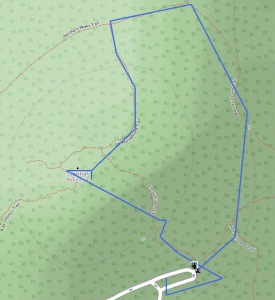 Decent: 0.93 miles along the Monadnock, Northern Peaks, and Mountain loop Trails. T-Mobile Coverage: Decent; kept bouncing between LTE and Edge but was able to use the data without too much problem. Well, we were going to get up early, pack all of our gear, and get on the road to go see the leaves changing color at Great Falls National Park. Of course, with two kids, and I'm not the best morning person either, getting out the door at any hour before noon is asking for a miracle. That and some of the roads we took to get there ended up being closed. So, by the time we arrived at the park there was a line to get in that was so long we couldn't actually see the gate. It was time for plan B. Plan B was to head over to Sugarloaf Mountain (about 40 minutes away) and hike around and maybe even setup my radio and do a SOTA activation. Luckily I had planned for this contingency and had my K1, SOTABeams Band Springer Midi antenna, batteries, a key, and expandable pole packed in my hiking pack. Our hike up from the East View parking area was pretty neat. The red trail (a.k.a. 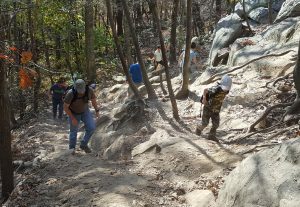 The Sunrise Trail) gets pretty steep in sections. My first harmonic, Harlan, was on his hands and feet trying to get up some of the rock scrambles that he encountered. At four (almost five) years old he really did a good job making it up the mountain. I'll be very surprised if you don't hear him activating some summits as soon as he gets that whole reading and licensing thing behind him! There are many ways to get to the top of the summit. With so many people on the mountain, today, we took the first parking spot we could find; I didn't want to chance missing the only parking spot because I wanted to try to park closer. The summit area was very crowded today. It's a good thing that the summit is very wide. I was able to move about 20 feet from the boulders that sit at the very highest point and setup my gear well away from everyone else. I was actually able to "hide" behind some boulders that were in the wooded area and be completely hidden to keep the curiosity down from others. This is the first time I have had this particular setup out in the field. The SOTABEAMS Band Springer Midi antenna and mini telescopic fiberglass pole take only a few minutes to setup. I'd say that within five minutes of arriving I was on the air. All the equipment performed well. I picked up six stations on 40m and another three on 20m. One of the stations I worked on 20m tried to work me on 30m but was unable to do so. All-in-all, I'm quite happy with the performance of the station. Honestly, the Elecraft K1 has a great receiver and the Band Springer Midi antenna performed well. This is also the first time using the K1 with the AA battery pack installed. No problems running the summit on eight 2800mAh AA batteries! 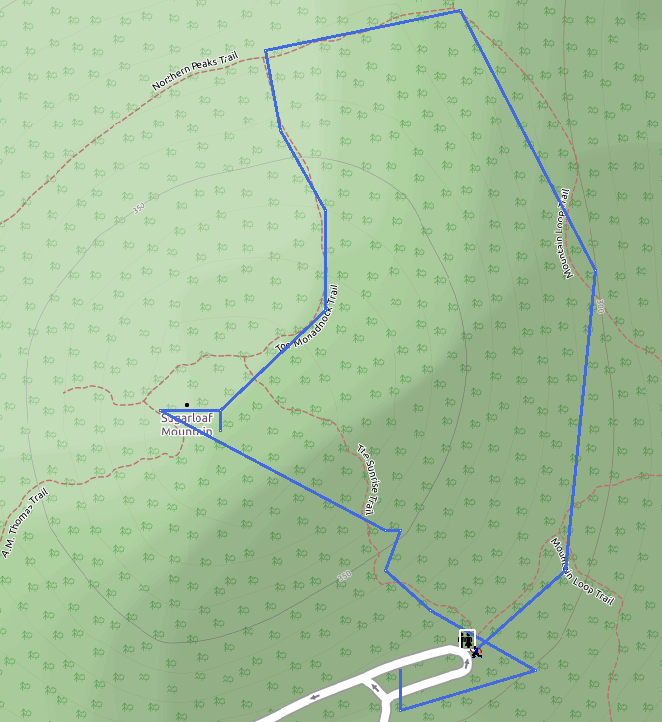 Also, APRS coverage was pretty good at the summit and along some of the trails. Me. I haven't been on the radio much as of late so my CW listening skills are horrific. I would show you my log but I'm too embarrassed. Another thing that needs improvement is my key. I tossed my Navy Flameproof key in the bag since it already had the correct connector on it but what I should have used is my trusty J-37 with the KY-116/U bracket to hold it to my leg (if you've worked me /m this is probably what I was using). Had I done that I wouldn't have had to do a two-handed operation: one hand holding the key, the other using the key. Disappointingly I heard K2JB on a nearby summit but couldn't get through the pileup on 40m to make the contact. There were a couple different summits on the air at the same time I was on the air but no S2S contacts today. Oh, yeah, and I didn't take any pictures of me, my station, or the perfect antenna installation. I guess that's the problem when setup takes hardly any time, you're on the air and then you're back to hiking! I put nine stations in the log today: 6 on 40m and 3 on 20m. I also tried 30m but was unable to complete any contacts there. I was going to try 17m but the family was ready to go. All contacts made using five watts. While putting the contacts in my official log I realized that I worked three stations that I had previously worked while they were activating a summit. I'm happy they took the time to tune me in and work me (since, after all, I was worth only 1 point today). The chaser has become the chased!